Is Z.Com Trade Broker Safe? Find out in our honest broker review! “Z.com Trade” is the service name of GMO-Z.com Trade UK Limited, which is part of the Tokyo-headquartered GMO CLICK Group – and makes up the largest retail forex provider by volume in the world. The group has over 450,000 traders who trade in excess of $900bn each month, and make up over 20% of annual leverage retail FX trading in the world! Z.com Trade is based out of its London office and is FCA regulated, and offers a range of FX, Indices and Commodities products on MetaTrader 4. Learn more about this broker in our Z.Com Trade Review! Z.com Trade Broker is authorised and regulated by the Financial Conduct Authority (“FCA”) in the UK, and operates on a ‘no-dealing desk’ STP model. This means client trades are passed on to its liquidity providers without intervention, allowing traders to feel at ease that there is no conflict of interest. It has been found out by the Z.Com Review that the company is part of the GMO CLICK Group, which also comprises of regulated companies in the global financial centres of Tokyo and Hong Kong, as well as London. The group has been recognized as the world’s largest retail FX provider by volume every year since 2012, and the parent company of the group, GMO CLICK Holdings, is listed on the Tokyo Stock Exchange. Z.com Trade offers a simple universal account for all traders for maximum simplicity, which has no minimum deposit or minimum requirement on the balance you must maintain. This allows you to start trading at a level you feel comfortable with, and Z.com Trade’s account opening team will ensure your application is processed within one working day after you submit your application form and supporting documents. 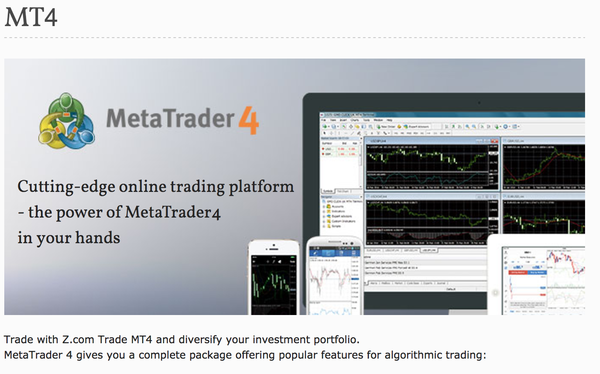 As has been spotted by the Z.com Trade review, it offers the world’s most popular trading platform – MetaTrader 4 – to its clients, and you can make sure you never miss an opportunity with support for the Desktop PC and iOS/Android mobile version of MT4. Expert advisors are supported, and MT4’s customizable interface and suite of technical indicators give you the flexibility to set up a trading environment which fits your own personal requirements. Over 30 languages are also supported by MT4, ensuring the platform is available for a wider international audience, and with the GMO CLICK Group’s secure and stable system infrastructure, you can be assured that reliability is ensured. Fixed spreads and no commission are offered for all of Z.com Trade Broker’s lineup of FX, Indices and Commodities products (though please note spreads may widen during conditions of high market volatility), and an individual leverage is set for each tradable product, in accordance with the underlying market’s risk profile. A maximum leverage of 1:200 is available on FX majors. As has been found out by the Z.Com Trade reviews, the company currently offer two different bonuses – a Welcome Bonus and Deposit Bonus. The Welcome Bonus provides new clients with a generous $30 (or €25/£20) after opening the account, which is available for withdrawal after trading 100 lots (note that 1 lot of FX = 10,000 currency units), and the profits are available to be withdrawn at any time, and in accordance with Z.com Trade’s normal withdrawal conditions. The Deposit Bonus offers an additional bonus when you deposit funds to your account in accordance with the amount you have deposited, up to a maximum bonus of $2,000 (or €2,000/£2,000) on a deposit of your choice. Profits from this bonus can also be withdrawn at any time, and you can withdraw the bonus amount after meeting the necessary trading requirement for the amount you have received. Client support from Z.com Trade is available 24/5 while the markets are open, and can be contacted via live chat, email or telephone. Z.com Trade’s team of friendly client support representatives will ensure any queries you have are answered promptly, no matter how big or small your question is. Funding your account is available at no cost from Z.com Trade Broker, and you can use your Debit/Credit Card (Visa, MasterCard, China UnionPay), Skrill account, or send funds via Bank Wire. Z.com Trade’s dedicated Finance team will ensure any withdrawals are processed are quickly, and you can also be assured that your funds are held in segregated client accounts with top tier financial institutions, and managed in accordance with FCA Client Money rules.